Masahito Sugihara is associate professor of saxophone at Sam Houston State University where he is hosting International Woodwind Duo Symposium on April 13-14, 2018. Please see http://www.awea-duo.com/iwds.html for details. He earned the DM and MM degrees from Northwestern University as a student of Dr. Frederick L. Hemke. Mas has appeared as recitalist and clinician in Asia, Europe, South America, and North America. He is a member of Awea Duo and Amethyst Saxophone Quartet, and has performed in the Chamber Orchestra of Philadelphia, Chicago Chamber Musicians, Chicago Lyric Opera, Chicago Symphony Orchestra, Ensemble Dal Niente, Grant Park Orchestra, Houston Ballet, Houston Symphony, Milwaukee Symphony Orchestra, Network for New Music, New York City Ballet, and Reading Symphony. As an avid arranger, Mas has transcribed a wide range of compositions for flute/sax duo, reed quartet, saxophone duo, saxophone quartet, and larger saxophone ensembles. Mas is a D'Addario and Conn-Selmer/Selmer Paris Artist. 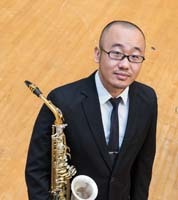 Masahito Sugihara Alto Saxophone Masahito Sugihara is associate professor of saxophone at Sam Houston State University where he is h . . .
Joel Love Piano Joel Love (b. 1982) explores an eclectic mix of genres, from short video pieces to works for chamber . . .